California Current Conservation Complex is part of the Tentative list of USA in order to qualify for inclusion in the World Heritage List. The California Current Conservation Complex is an incredible, dramatic and ecologically important coastline and marine area stretching from Point Piedras Blancas in the South and Point Arena in the North. As the crow flies, 425 km separate these two points. In between, is a diverse mishmash of state parks, marine reserves, conservation areas, national seashores, national recreation areas, and a national monument that spans the whole California coast. The Bureau of Land Management, National Park Service, and California State Parks manage most of these special lands and seawaters. The predecessor to this whole scheme called California Current Conservation Complex is the designation of the California Coastal National Monument in 2000, which was recently expanded twice by President Obama in 2014 and 2016. There are several gateway communities to begin exploring this vast coastline: Piedras Blancas - San Simeon, Pigeon Point, and Point Arena. To learn more information about this region, Monterey is the ideal starting point. The Monterey Bay Aquarium is splendid and certainly the best aquarium in California. 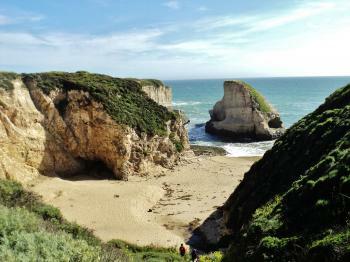 From Monterey you can head south toward Big Sur or north to further explore Monterey Bay before arriving to Santa Cruz. Despite its more famous southern neighbor the North Coast and Coast Dairies are as dramatic, wild, and beautiful as any portion of the California coast. Over the last decade, I’ve made dozens of excursions to different areas of this protected region. Each visit is rewarded with new discoveries that have increased my appreciation of “California’s [marine] Serengeti”. In fact, I have plans to visit Point Reyes National Seashore soon, which will complete my full exploration of the coastal portion of the California Current Conservation Complex. I’ve viewed one of the keystone species (Sea Otter) on more than one occasion in the Monterey Bay region; it’s fascinating to see this mammal use stones to crack open sea urchins! Several species of whales, seals, dolphins, and sharks are also not uncommon sightings. This is an ambitious nomination, and it will be difficult to compile such a complex dossier with so many stakeholders. However, I am confident IUCN will have little critique in regards to OUV.